The Pentagon is stepping up its investment in an autonomous Navy. That’s good news for a handful of contractors not typically associated with shipbuilding, and a potential warning shot at the companies responsible for building the current fleet. The U.S. Navy fiscal 2020 budget request includes $447 million for two large unmanned surface vessels, with plans to continue to buy two per year through at least fiscal 2024. That’s a small drop in the overall budget, with the Navy requesting $34.7 billion for shipbuilding, but significant progress toward the long-term goal of building a robot Navy. Inspired by the increasingly sophisticated threat posed by China and Russia, and by a need to expand without breaking the budget, the Navy has been pushing to expand its autonomous capabilities. The service hopes to see the same sort of dramatic expansion of capabilities the Air Force experienced when it first introduced drones over the battlefield in the 1990s. 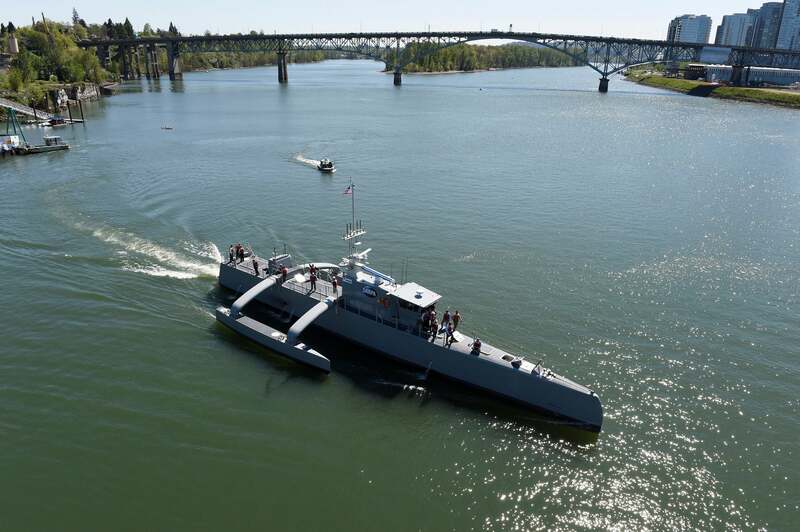 The Leidos-designed Sea Hunter gets under way following its christening ceremony in Oregon. Image source: U.S. Navy photo by John F. Williams. The impact for the Navy could be even more pronounced than what drones did for the Air Force, as in theory crewless ships would be significantly less costly to operate due to the large number of personnel assigned to traditionally vessels. The Navy did not provide exact specifications for the vessels it is seeking, nor how it intends to use them. But the spending request is potential good news for Leidos Holdings (NYSE: LDOS) , the government contractor behind the autonomous Sea Hunter test ship, which recently successfully sailed from San Diego to Hawaii and back with little human intervention . It’s likely that the ship the Navy is seeking will be larger than the Sea Hunter , a 132-foot-long trimaran, and it’s far from clear who will build it. Leidos is not a shipbuilder today, having sourced construction of both the Sea Hunter and its forthcoming sister ship to third parties. But given the vessel’s success, chances are that the Leidos technology that made it work — which was initially developed by the Defense Advanced Research Projects Agency based in part on work done for the Mars Exploration Rover — will likely be employed on the final design. 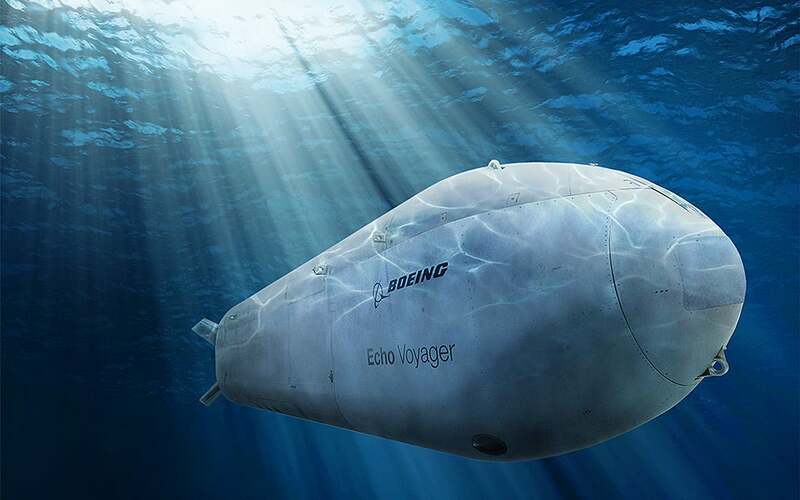 The Navy also provided an endorsement to an autonomous submarine built by Boeing (NYSE: BA) . The contractor in February was awarded a $43 million order for a version of its Echo Voyager large unmanned submarine , and the Navy would like to buy a total of nine of the subs through fiscal 2024. It would be wrong to call shipbuilding a pure duopoly. Lockheed Martin for example builds a variant of the Navy’s littoral combat ship in Wisconsin. But General Dynamics (NYSE: GD) and Huntington Ingalls (NYSE: HII) today are certainly the dominant shipbuilders for the U.S. military. It remains to be seen whether that will still be true two decades from now. It’s still early days, but autonomous technology is creating a path in for newcomers like Boeing and Leidos, as well as Textron , to get more involved in Navy procurement. For General Dynamics and Huntington Ingalls, that means new competition and a risk of moving down the food chain if they are stuck doing the lower-margin construction work on futuristic ships while the more lucrative electronics work is done elsewhere. However, it’s premature to hit the panic button. The incumbents are also investing in autonomous tech and in some cases are working with newcomers on their Navy projects. Huntington Ingalls, for example, is building the Boeing submarine. And for now at least, the big-ticket vessels are a priority. At a news briefing following the budget release, Lt. Gen. Anthony Ierardi, director of force structure, resources, and assessments at the Pentagon, said the autonomous buys are part of the Pentagon “looking to the future differently than we’ve looked at the past,” but he said it does not imply that the Navy will stop buying carriers or submarines. For investors in Boeing and Leidos, the Navy’s plans offer nothing but upside. If things go well, the Navy’s growing interest in unmanned surface and undersea systems opens the door to potential new revenue streams. If there’s a stumble or the technology doesn’t progress as hoped, very little of the companies’ core business is at risk. The outlook is more complicated for Huntington Ingalls, which is primarily a shipbuilder, and General Dynamics, which has other businesses but relies on the Navy for a significant portion of its revenue. The total fiscal 2020 shipbuilding budget request is the highest in more than two decades, and the Navy intends to purchase new aircraft carriers, submarines, and destroyers for the foreseeable future. These businesses are at no risk of seeing their orders dry up. But autonomous vessels could play a key role in the Navy’s push to grow its total fleet by 27% to 355 ships , either creating more competition for funds or alleviating the need for all of the large vessels the Navy has on its wishlist. That in turn has the potential to stunt long-term revenue growth for the primary contractors. The outlook won’t change overnight. Still, this is a long-term trend that investors need to monitor. David and Tom just revealed what they believe are the ten best stocks for investors to buy right now… and Boeing wasn’t one of them! That’s right — they think these 10 stocks are even better buys. Lou Whiteman has no position in any of the stocks mentioned. The Motley Fool recommends Textron. 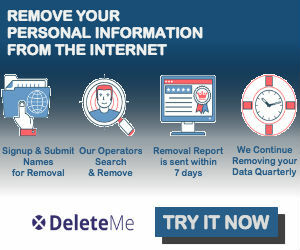 The Motley Fool has a disclosure policy .